Tungsten and fluorescent video lights are great for a wide variety of filming applications, including reproducing warm interior lighting and softer, up-close lighting of subjects. Sure, they may not be as versatile or efficient as LEDs, but fluorescent/tungsten lights still have plenty of on-set advantages. Tungsten lights are an affordable way to create nearly perfect color rendition with no warm-up time and added dimming capabilities, while fluorescent lights produce soft, even light over a large area while running cool. We carry a large selection of fluorescent lamps and daylight tungsten bulbs for video, stage and photo lighting. 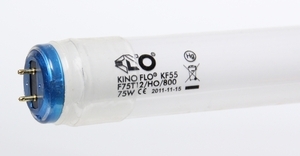 Brands like Kino Flo, GE and Osram manufacture 3,200-Kelvin bulbs, 5,600-Kelvin bulbs and green screen fluorescents to help you achieve the ideal lighting environment anywhere. Buy daylight fluorescent tubes that offer a long life or stock up on the right film tungsten fluorescent light tube for your exact lights. Have questions about which type to choose? Reach out to us by phone at 1-888-276-3667 or by e-mail at info@barndoorlighting.com.